Delving into the invisibility of labor under automation, the film offers an entry point to the everyday world of seafarers, the carriers of 90% of the world’s goods. “They Thought They Saw A Ghost” stages a series of abstractions: the function of the working body, the empty stage of automated environments, the touristic gaze on the spectacle of mechanization, the comfort of religious beliefs and the faith in the emancipatory horizon of technological innovation. 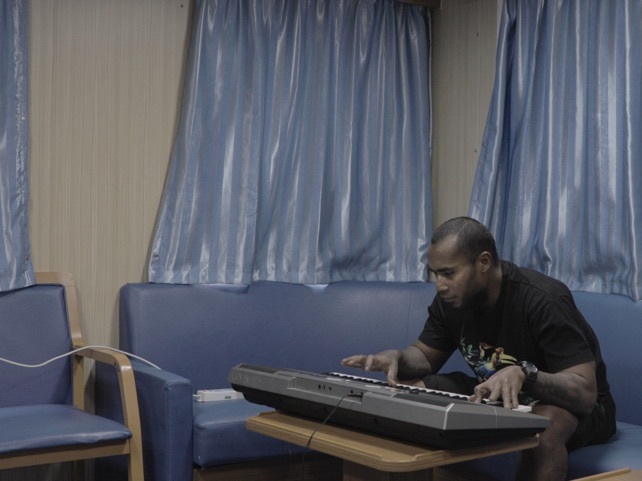 It presents voices from multiple perspectives, catching a glimpse of the social infrastructure that provides seafarers – whose presence is still necessary – support and care. Unfolding as a visual essay, the film is a chaptered immersive observation of time transformed by automated technologies. The film is the cinematographic result of a visual research originally commissioned for the Dutch Pavilion at the 16th International Architecture Exhibition La Biennale di Venezia in 2018.